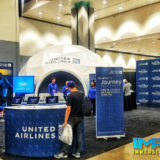 Immersive Experiential specializes in delivering world class immersive dome programming for all of our dome venue installations. We can provide our clients with custom fulldome programming or can offer a library of fulldome shows that are available for license. We also co-produces a number of dome shows that we prototype at our fulldome theater, dome studio, and immersive events venue. An area of focus for our dome programming is developing live shows in domes that feature live performances in domes that interface with the dome programming in unique ways. 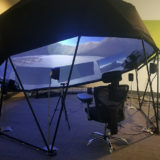 We are developing real-time interactive applications that allow for the performers to manipulate imagery in the domes and enhance their performances. We can tailor the content to match a performance in an immersive display format that provides unique experiences for an audience. Our team consists of some of the top visual effects artists, real-time interactive programmers, and producers in Hollywood and the world and combine to deliver these powerful immersive experiences. We scale our dome programming productions to meet project requirements and pride ourselves on working closely with our clients to design and specify their content to meet those specifications, budget, scope, and vision.